Preparing for our first 30 mile day, we got up well before dawn to start hiking in the dark. We’d informed the motel managers that we’d leave the key in the room since we were leaving so early. It was pitch black when we left the hotel, our headlamps on full blast. This was our first night hiking adventures since summiting Katahdin back in August. We followed S.R. 20 for a mile or so before trying to locate a bike path that went through the north end of Blountstown, through neighborhoods. The sky was starting to lighten as we made it to the edge of town and we finally extinguished our headlamps. We were attempting to make it halfway to a gas station/grocery store for an early lunch. The main road out of town was fairly busy with morning commuters and a few school buses picking up rural kids. The sky was cloudy for some of the day and seemed to threaten some sprinkles, which we did feel for a short minute or two later on in the morning. All along the road walk I kept looking for places that would be good stealth sites but it was quite lacking. After the busy road we mostly followed quiet farm roads that were mostly pleasant to walk on. We would rarely have to ditch to the side of the road but it was funny to see several cars pass us several times throughout the day. Some of them must’ve thought we’d gone incredibly slow. Road walking makes you take notice of trash and debris on the side of the road. By far the most drank beer in the countryside was Natural brand and the most smoked cigs were 305s. Not sure why these are the choice of Florida country folk, but this was by far the most common type of litter we saw. At about 10:30, maybe a little earlier than that we arrived at Shelton’s Store on the northwest corner of the intersection of SR 73 and CR 274. It was definitely a country store, the bathrooms on the outside of the building and vintage gas pumps out front. The inside looked to be lost in the 70s with items that might have been that old lining the shelves, particularly beauty products and car reapair parts. The food items were sketchy looking hot dogs and microwaveable burgers. I went for the burger because at least it was frozen for awhile. We sat outside for a good hour eating our food and drinking soda before deciding to get the next 15 miles out of the way. At one point an antique looking fire engine roared passed heading for a fire that we saw smoking a few miles behind us. Maybe an hour later they came back, this time driving normally. Our afternoon break was next to a ditch by someones house. The owner, a man, drove up shortly after we sat down and chatted with us for a second. Moseying down the road we came to a road crossing at SR 167, crossed it and followed a dirt road before getting to US 231, a four lane divided highway. At the intersection was a shop, I can’t remember if it was auto repair or something else, but the workers noticed us and chatted with us for a second having seen us road walking several times throughout the day. We crossed the highway easily and found ourselves down a another dirt road where there were signs for several churches where we thought we might try to refill our water but found the churches were quite a ways off the trail. We passed trailers and rowdy dogs tied to chains, homes you didn’t want to linger by. 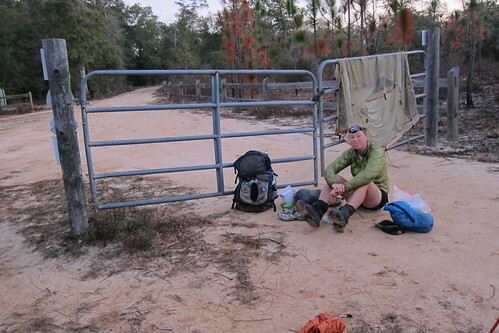 Finally we found the Econfina Creek WMA where we decided to make camp right inside the gate. 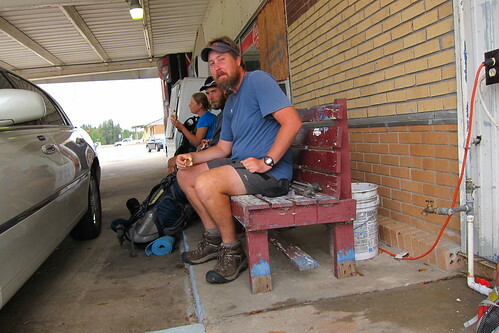 Speaker had thought we’d really done 31 miles since we’d started outside of Blountstown that day. In the parking lot, initially empty when we arrived, we found an unopened bottle of water. Score! Now it wouldn’t be too bad and we’d have extra water for dinner instead of using what we’d need for the morning too. 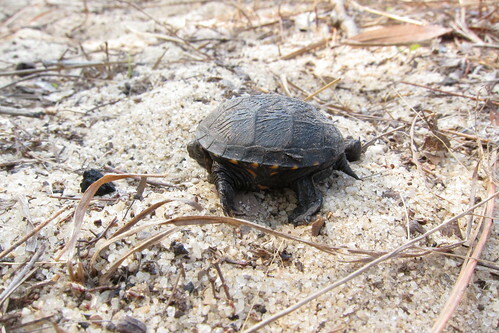 Speaker had taken a longer break at the ditch and caught up to us about thirty minutes after we’d been there. Shortly after we’d arrived a car showed up and idled in the parking lot for awhile. Then another car arrived and the person, I think a woman, got in the car of the, I assume man, and they sat there for awhile. A long while. Like an hour. Not sure what was going down but I didn’t want to know. They eventually drove down the dirt road where we could still hear the car idling but at least were out of sight of us. Eventually, after we’d already gotten in the tent they drove off. Speaker had decided to head to a supposed campsite down by the creek for the night, wanting to put in a few more miles to top off his all time mileage. We probably could’ve done it but I was just feeling done from the day. The road had put a blister on one of my feet, the first in awhile. The next morning we made it down to the creek and it was a beautiful hike. The trail meandered along the creek, crossing beautiful spring fed tributaries into the creek and made me think of the AT a lot. We got to the first major bridge where we found Speaker still sleeping in his hammock. We stopped for a second to chat and told him where we were planning to make it for the night, somewhere near a gas station down S.R. 20. He was going back and forth as to where he wanted to stop for the night and after we left him that morning we didn’t see him again until the following day. 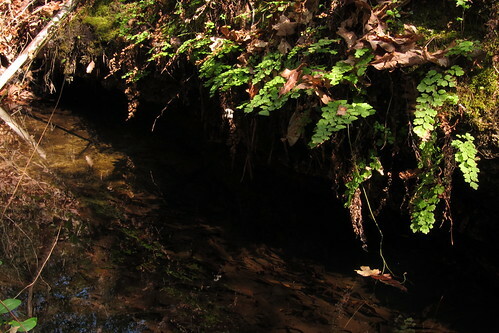 So many beautiful spots abounded along the creek. 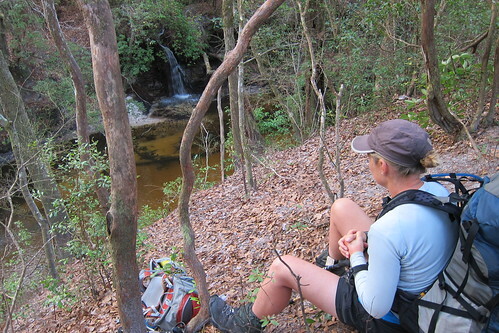 We came across a small waterfall, our first on the trail, where we could have gone across on a homemade zipline. 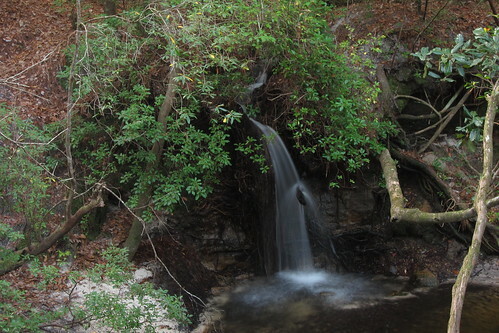 We opted not to use the zipline but got a few photos of the waterfall. Had it been warmer this would have made a great swimming hole. This section of trail was great, mostly worth the ridiculous roadwalking. We found several drive up type campsites that would have been great spots for a backpacking campsite as well, complete with trash cans at the sites. Most of the morning was spent just meandering along this creek and at one point we came out of the creek to the top of the bluffs and into a clear cut area. It was hot up there and we were glad when we finally ducked back into the woods. Along the way we came across something that I very nearly stepped on. 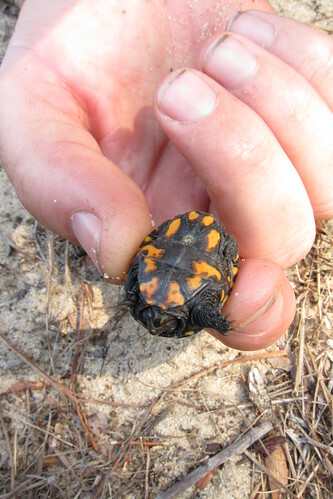 It was a baby turtle! Of course we stopped and took a lot of photos of this cute friend. We’d been on the top of a hill so we decided to help the fellow out and carried it with us until we got closer to the creek, giving it a bit more of a chance in life. We never got back to the main creek but found a side creek that had some steep ups and downs that really made me think we were on the AT. Taking a short break on some tree root type steps we let the little turtle hang out near the water for its chance for freedom. We’d check every few minutes to see if it was still there and it was until finally we checked and it had swam away! 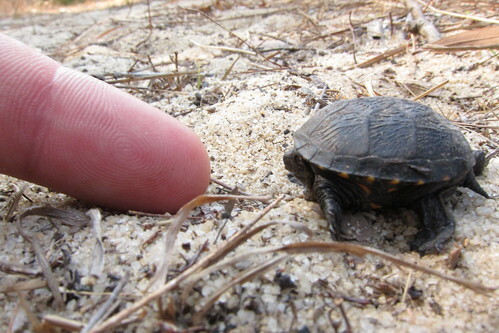 So long little buddy! Up at the top of the bluff we entered a few open pine areas and I was disappointed we’d be leaving the creek until we ended up going back down into another spring/creek. Again, so much was reminiscent of the AT. This was not the Florida we knew! 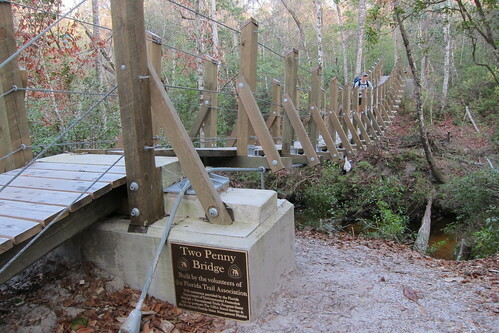 This was a whole ‘nother trail! 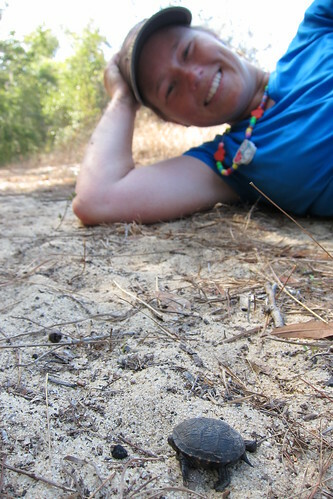 We took lunch in the middle of a planted pine forest where the pine needles created a great cushion for napping. We were just short of the Little Porter Pond campsite but had no idea. 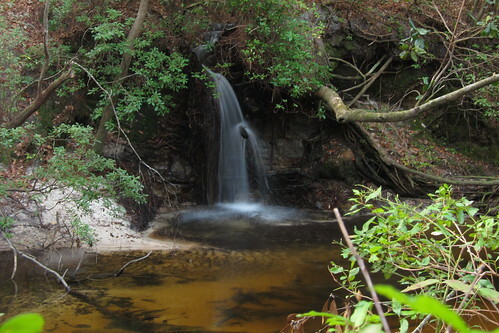 We’d finally left the creek areas and started climbing up onto large, old sandhills in planted pine and scrub areas. At one point, almost out of the WMA, I looked back over where we’d hike to see hills! Hills, people, in Florida! This wasn’t like the hills of Ocala, this was much more terrain than we’d seen so far. Back on SR 20 we continued our road walk west, seriously hoping for the promised gas station at SR 77 and SR 20. The book had said that we might get permission to stay behind the gas station but when we arrived and asked the cashiers they promptly said no and looked at us like we had two heads. We instead filled up on chicken tenders and thick cut french fries, soda and bought a gallon of water to refill our water. We’d scouted some potential stealth areas along the way, all on private property but with potential to duck far enough in to not be seen. After the gas station we walked about a quarter mile before we saw a thick pine plantation where we waited for the traffic to quiet down before ducking into the woods. 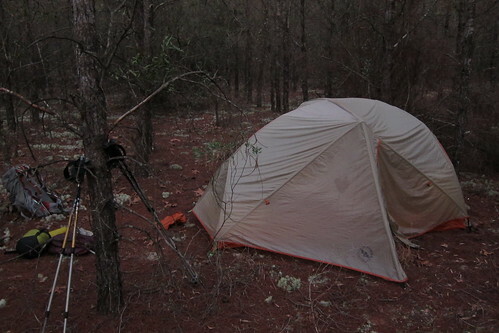 We walked in quite a ways and set up our tent where we made a second dinner and got ready for bed. Our stealth rules were to not use our headlamps unless it was on red and to be very, very quiet. I got a little nervous because at one point I thought I heard a dog relatively close but decided that I was being a little paranoid. I mean, we were tresspassing, but what else were we going to do? 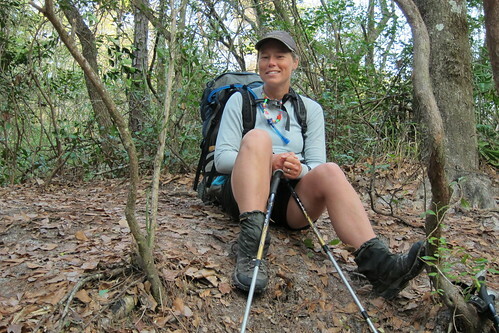 This is my biggest point of contention with the Florida Trail, the lack of camping anywhere in roadwalks. The campsite turned out to be a nice place to stay and luckily I had my ear plugs to drown out the nearby road traffic. The night went well and we were up and gone relatively quickly in order to bypass getting caught by an angry landowner. Off we went for more of our roadwalk. At this point we weren’t sure if Speaker was nearby or ahead of us as there was no way of really following footprints on the road. 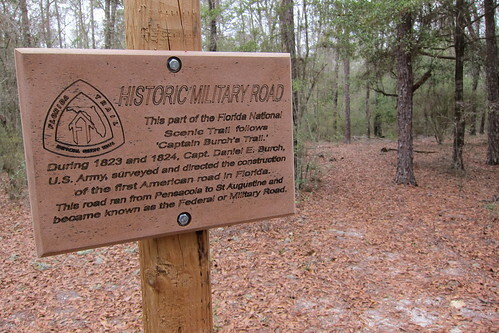 The book explained that the trail had once gone through a private pasture but had asked the FTA to remove the trail from their property, instead making it a roadwalk. We’d failed to look carefully at the map and the book to see where the trail been rerouted so whereas the book said the trail followed the road through Ebro, where we had a maildrop, the map reflected the trail entering the Pine Log State Forest. We’d planned to do the east section of Pine Log despite it being a bit out of the way, and then roadwalk up S.R. 79 to Ebro to pick up our maildrop. Several miles before the turn off to Pine Log we took a break by the side of the road. About ten seconds after getting back on the road a white van passed us and honked, slowed down and then turned around. It was Gatorade Gordan. We’d heard about him from Speaker and Chuck Norris. 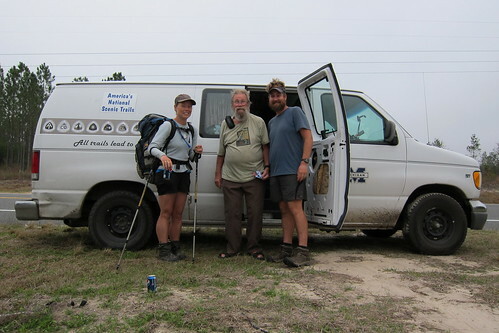 He was an older man who frequently helped support hikers on various long trails throughout the U.S. He was supporting a hiker that was half a day behind us now, having taken a few days off to nurse his feet. He’d been ahead of us for a long time and we never thought we’d see either one of them. Gordan pulled over and we introduced ourselves and he gave us a soda and we talked to him for a few minutes, explaining how we needed to get to Ebro for a maildrop and where we were intending to get to for the night. He was incredibly nice, but he has health problems and lives out of his van. This guy is incredibly sweet and bends over backwards for hikers and deserves to be repaid in kindness and in money. We set off, not sure if we would see Gordan again in the future. Down the road we saw him pull over to show us where the trail got off the road and onto a power line right of way before crossing into the Pine Log State Forest. I was a bit nervous how the forest would go, if it would slow us down or not but it turned out to be a great place to hike. Local Boy Scout groups had done great trail maintenance, creating bog boards and keeping the trail clear. It’s too bad we didn’t get to see the other side of the forest, but the east side was quite nice. We came up to S.R. 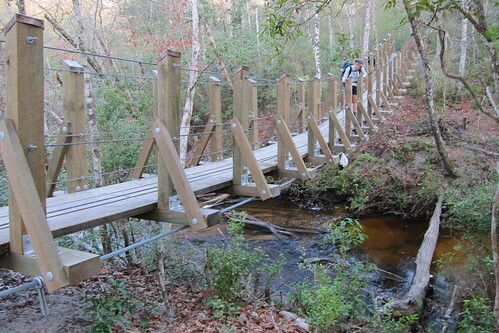 79 where a great pedestrian bridge for the trail had been built. The road was still under construction so we had the east side of the road to ourselves as we walked north to the post office. At the post office Chris picked up the box and the woman running the office had said she was getting worried for us since the ETA on the box was for several days prior to when we’d actually arrived. Oops! I’d forgotten to tell my mom what date to put on when I told her to ship it. It was our last maildrop on the trail. We sat in the parking lot sorting everything out, dumping things we had too much of and carrying a few extra things than needed. It was not fun having a heavy pack again! We’d just left the post office and was heading back towards the S.R. 20 intersection when we saw Speaker walking towards us. 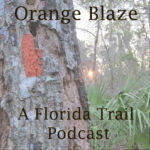 He’d stayed on the roadwalk instead of following the trail into the forest and had stayed the night before back in the woods of Econfina Creek, so he’d had even more of a roadwalk that morning than us. He was looking for the library, which we said we didn’t see, so we went to the intersection and found a Subway at the gas station and had a sandwich for lunch. We were making good time for the morning and had decided to walk past where we’d thought to stay for the night, somewhere near Bruce, potentially behind the cafe. We left the Subway and crossed the Choctawhatchee River where on the bridge we heard a high pitched sound and found bats tucked into a hole in the side of the bridge. Pretty cool! I wish I’d gotten photos of them! Since we were ahead of schedule we took an extended break on the side of the road and then another longer break with dinner at the Ebro Cafe. The Ebro Cafe is a very small mom and pop restaurant with red and white checked table cloths. The locals inside asked us about our hike and of course had all sorts of questions. After eating and refilling our water Chris and Speaker checked out the gas station/grocery across the street for ice cream and other goodies and then we went on our way down the road. The trail splits from S.R. 20 and up S.R. 81 where we were searching for a place to camp for the night. We kept passing places that just looked not so great and weren’t as far as we wanted to go for the night. Eventually we saw a man come out of the woods on an ATV from the east, cross the road and go to a house across the street. After we’d passed this man’s land, a fence, we found a few paths leading into the woods on the east and decided to make that our campsite for the night. It was probably the more nervewracking sites we chose because after we’d set up a truck drove past down the dirt road on the other side of the fence, luckily not spotting us. The next morning we got out as quick as possible despite the threat of rain and a small bit of rain before we got out of the tent. We ate quickly and got the heck out of there before the guy made his morning round of his property. The last thing we wanted was him to alert whoever owned the property we were on that we were there! Down the road we went for the Nokuse Plantation.